A report by the Abaad Studies and Research Center said that the Yemenis in the south feel that it is their chance for self-determination and disunity from the north. They believe that their celebration of the October 14,1963 anniversary when the southern revolution won against the British occupation, is the start of the countdown for Aden to separate from Sana’a. The report which was released by the Abaad branch in Aden said that the southerners see that legality of the separation proposal comes this time from the takeover of Sana’a by the Houthis armed movement on Sept 20 after the Houthis movement imposed a new armed reality which replaced the transitional rule that was included in the GCC initiative that sponsored a peaceful power transfer. The GCC initiative was signed by regional and international supervision in Nov 2011. 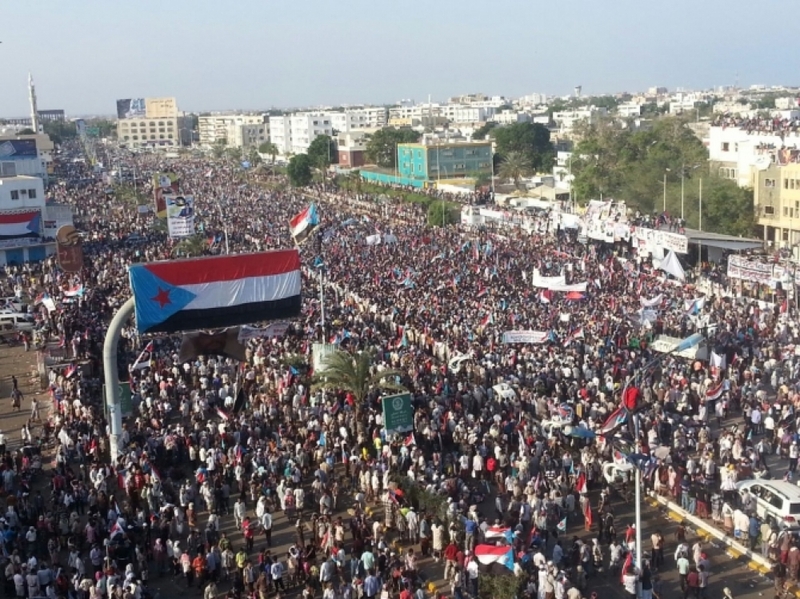 The southern governorates especially Aden witnessed a calm during the rule of president Abd Rabo Mansour Hadi that never seen before since the southern protests erupted in 2007. “President Hadi succeeded in controlling the situation in the south in difference to his predecessor, but he failed to tackle the situation in the far north, while he moved forward with the Hirak, his rule was stabbed by the Houthis after they took control of towns and military camps, most importantly the capital Sana’a,” the report reads. The report highlighted multiple scenarios expected for the south of Yemen amidst instability of the Republic of Yemen, disability of the president and political parties who co-rule in the transition towards armed control of the new partners in the rule. “The first scenario is that the southerners would achieve quick and complete separation in case they had strong leadership agreed by all Hirak entities to lead the southern state during the self-determination period, received regional and international support to avert sliding into southern-southern fighting,” the report reads. The third expected scenario would be “inspiring, but unachievable”. It is that the Southerners would go for adopting a new formulation of Yemen’s unity based on the rule of law, political pluralism and democracy away from lobbies, regional and social influence. “This would require them (southerners) to lead the political and military struggle to force the Houthis militias to end their control of Sana’a that fell in their hands in time the presidency, the prime minister and the commanders of the army were in the hands of southerners,” the report noted. The report said that many threats surround their hope in retrieving what was known the Peoples Democratic Republic of Yemen and its capital Aden which makes the safe separation hard to be achieved in the short-term. The first risk is international fears that the south separation in its present situation which is viewed as a store of non-political ideology which would possibly be a source for jihad movements that may take control of some governorates in a case a political conflict broke out similar to the 1986 that resulted in a social and humanitarian disaster that did not leave the memory of southerners until today. “The risks that would threaten the new southern state in such situation raise the concern of using the Houthis by external powers to target and disrupt the ideological store. And Preparation of that mission has already started by presenting Rada’a in Al-Baida, one of the most important landmarks between the north and the south as a city under the control of Ansar Al-Sharia,” the report reads. The report said that language of Houthis leader speeches has already changed. He speaks as super-religious authority on any political development in the north or the south. The speech of the Houthis’ leader started reflecting a new task, the external powers want him to do in the south. He (the Houthis leader) may go for it (the new task) through false mottos such as maintaining the state, implementing the NDC outcomes in the south, protecting Yemen unity and fighting terror. But, he will in reality go to control the strait of Bab Elmandab, a thing which interprets the new expansion on the Yemeni western cities on the Red Sea among them the second Yemeni port which is Hodeida port. One of the risks that also threaten the expected southern state is that the civil war that failed in the north can work out in the south. ” The second risk is that ideology and regionalism are highly present and with drawing old conflicts on powers amidst no unified leadership and no trust among southerners,” the report said. The third risk is that separation would fail completely in the south and it would slide into disintegration and the emergence of minor states because of constant talks of Gulf interests in Hadramout, British interests in Aden, Iranian interests in the strait of Bab Elmandab and American interests in oil sources areas between Shabwa and Hadramout. The fourth risk which would be a timed-bomb that would go off on the face of the southern dream after separation, is the internal conflict among the Hirak entities particularly the armed faction of the Hirak where some of this faction are linked to Iran and Ansar Al-Sharia. “Some Hirak leaders have former connections with Iran. They visited Beirut and Tehran and joined Ansar Al-Sharia and became effective inside the Hirak. They might work for taking the rule after separation is done,using the same method the Houthis used in the north, hence the south will go for either the violent and terror groups or Iran influence,” the report predicted. The report said that all choices became hard for Yemenis and not only southerners particularly with the Houthis’ repetition of Iraq version in integrating their militias in military and security units and eliminating the military role by taking control of high-advanced units particularly the air forces to complete their control over the country. The report expected that developments in Yemen and information on the existence of indirect international support for the Houthis is probably a green light for Iranian role in the region that would not stop in Yemen, but will extend to the Gulf particularly Saudi Arabia.